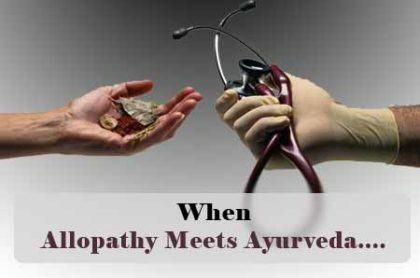 Allopathic Surgery, Ayurvedic Medicines- And the combination Works! Meerut:In a one of its kind surgery, the two pathies of allopathy and ayurveda were seen coming together to bring about a miraculous recovery for a patient who was allergic to antibiotics. A successful prostate surgery was performed on an 83 year old man by a team of doctors , who removed a massive 240 gm of prostate, without using antibiotics. Antibiotics, an inseparable part of the standard operating procedure, were not used surprisingly not used during this surgery. The only thing that was used during the procedure was anaesthesia, with recovery being totally dependent on ayurvedic medicines.The use of ayurvedic medicines was necessitated by the fact that Ojaswi Sharma, the patient, was allergic to antibiotic medicines. Mr Sharma responded well to alternate medicine. The team operating on the old man coordinated with the best brains in ayurveda, surprising the medical fraternity, which has on many occasions doubted the efficacy of ayurvedic medicines. The procedure has been deemed a rare feet, especially in the face of growing concern about the ineffectiveness of antibiotics due to antimicrobial resistance.” Surgical procedures are highly dependent on allopathy as of now. Conducting surgery with ayurvedic support is the beginning of a new era,” said Manoj Kumar, Director, Orthopaedics Department,Delhi’s Maulana Azad Medical College, according to the news daily. Mr. Sharma, who was admitted to the Anand hospital a month ago, has recovered completely now. 0 comment(s) on Allopathic Surgery, Ayurvedic Medicines- And the combination Works!